Within 250 miles of Waldorf, MD. 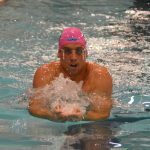 Your swimmer is going to improve their breaststroke and butterfly at this swim clinic. We specifically selected visually impaired Paralympic gold medalist Tucker Dupree to work with participants so that they can get a deeper appreciation for what the strokes FEEL like when swum at a high level. Your swimmers, no matter their ability level will get lots of feedback and leave the clinic better prepared to swim both strokes in practice and in races. Tucker will lead two sessions. Each session will be geared to specific age groups and ability levels. Participants of this clinic are going to learn how to swim a fast and RELAXED butterfly stroke. We are going to focus on 5 key areas of the stroke that will help participants swim fly more effectively and DROP TIME! Body position: Stay right on the surface and press your chest to keep your hips high. Engage your core so that you can ride along the surface of the water with ease. Kick: The dolphin kick can be a challenge for swimmers of all ages! The way that you have to use your chest, core, and hips takes a lot of muscle control and strength! Practice drills with Tucker and learn the essential components to a strong and smooth fly kick! Pull: The butterfly arm pull is multi-dimensional. How long should you reach? How deep should you pull? Tucker will show each swimmer the right arm pull for them while also learning how to get more power out of every stroke. Timing: Breath, kicks, and arms, they all happen at the same time! The key to a smooth and relaxed butterfly is the timing of how each component fits together. Build a better butterfly and you won't believe how much faster you go with an easier stroke! Swimming a fast and efficient breaststroke requires one of the most difficult skills in swimming: PATIENCE. Literally! If you truly desire to be good at breaststroke you need to find the rhythm in your stroke and have patience throughout your race before taking your next stroke! Learn how to get more out of every stroke cycle and start dropping time. Kick: The breaststroke kick can be a challenge to learn and even harder to perfect. Unlike anything in swimming, your feet must be flexed and wide as you begin the kick. Snap your feet together keeping your knees close and hips high to jump off the water every stroke. Tucker will teach participants at this clinic how to improve on their breaststroke kick! Pull: Smaller is better! Don't sweep around for a huge pull, keep it small and quick so that you grab onto the water and then shoot forward with each stroke. Timing: The WHEN in breaststroke requires precision, focus, and patience. Don't rush into your pull, kick, or breath. Understand how each piece of the stroke fits together and walk away from this clinic a faster breaststroker. Take a photo while wearing the Tucker's medals, get autographs, and a gift from TYR Sport!